Azadeh and Jorge celebrated nuptials for a second time with each other. 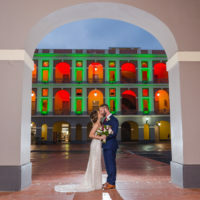 They had too many loved ones both in the US and in Puerto Rico, so they opted to get married twice, the second time at the infinitely gorgeous Villa Montana Beach Resort in Isabela. So while some newlyweds would argue having one wedding is hectic, they managed it twice like champs and enjoyed it as if it was the only one. I arrived early that day to Jorge’s villa where he was getting ready with his college friends. They were all super excited and also eager for the photos, which always makes me happy! After details, many jokes, and portraits the couple participated in an emotional gift exchange: Azadeh gave him a beautiful wedding ring, while Jorge gifted her with a honeymoon in the Dominican Republic (which she thought was not gonna happen for a while). At the bridal villa, I immediately fell in love with all the details she had put together for this day: an amazing dress, blush bridesmaid dresses, tropical floral robes, blush bridal shoes, a beautiful peony bouquet, and gorgeous stationery… I was swooning! Azadeh was very interested in the photos, so we spent quite a lot of time doing bridesmaid and bridal portraits. Tip for Brides: Bridal and bridesmaid portraits take time. It is recommended to schedule at least an hour for the bridal getting ready and portraits. Everyone’s hair & makeup should be ready by that time, so we can start getting dressed right away. If your bridesmaids are getting ready somewhere else, but will be joining you for the bridal session, make sure they know exactly when to be there and why. Most times, when a bridesmaid is missing we either take incomplete group photos, or have to re-take them after the ceremony. I don’t wanna take up anyone’s cocktail time if unnecessary!! After the bridal portraits were done, a beautiful sunset wedding ceremony started. I wasn’t at the first wedding, but some guests were talking to me about how amazing Jorge’s vows were, he had translated all his vows into her family’s language, and that had everyone in tears. This time around, both vows were emotive and had even the vendors nearly crying. It was evident that their love, connection, and devotion to each other ran deep, and as a photographer, that was infinitely inspiring. After the I do’s, first kisses, and celebration, we captured some beautiful sunset newlywed photos on the beach, followed by all the group family photos before moving to the reception party. It was an amazing evening, with lots of dancing and celebration and I was so glad to be trusted with their special moments! Hope you enjoy this set of photos I captured at this sunset beach wedding. love stories in Puerto Rico and worldwide. Contact Cami here.